Welcome to yet another wonderful Altenew release blog hop! 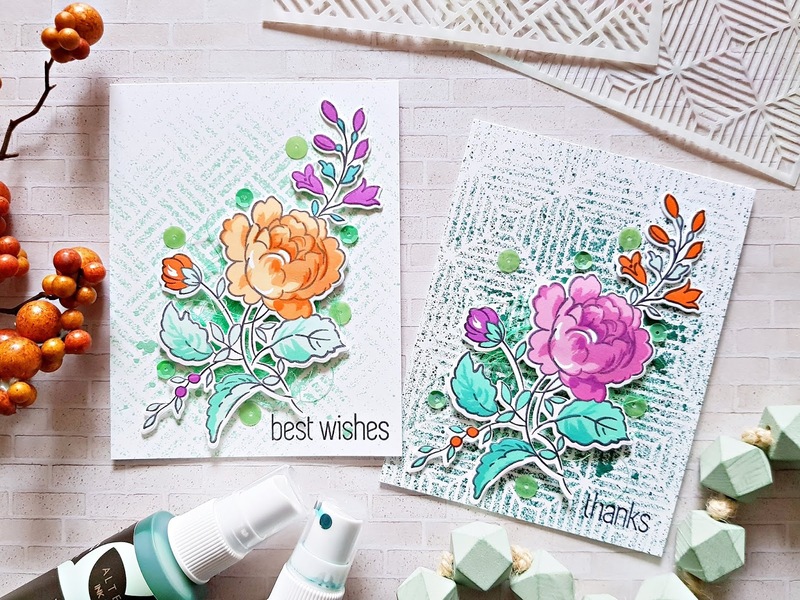 This time it's all about fun new stencils and gorgeous ink sprays! You should have arrived here from the amazing Aga's blog! Let's see the cards I've made with the awesome new products! With the exception of 2 cards I actually kept to the color scheme of the new ink sprays because I loved how well they worked with each other. I've used a top folding, A2 card base for all of my cards. On my first card duo I used the Handpicked Bouquet stamp and die set from the November release as well as the Beveled Squares, Square Weave Pattern stencils and the Mountain Mist, Lagoon metallic shimmer ink sprays. Gosh, the shimmer in these sprays! So gorgeous! I just lightly sprayed my backgrounds and let them dry. I stamped the sentiments directly on these panels. I used the coordinating oval ink pads to stamp my flowers, then using the coordinating die, I die cut them. I added some foam adhesive to their backs and tuck tangled, metallic thread behind them before adhering them to the card front. Last but not least, I attached some sequins here and there. Next up is this duo! I sprayed a bunch of white card stock with all 6 shimmer sprays: Mountain Mist, Lagoon, Puffy Heart, Cosmic Berry, Sunkissed and Orange Cream. Using my favorite Layered Floral Elements die set, I die cut lots of flowers and foliage. I adore these colors! I lay the stencil on an A2 size white card stock and dry embossed it using my die cutting machine. I did this with both stencils I used above. To be honest I wasn't sure this was going to work, I've never done it before, but I love the result. I love the texture it adds to the card stock! I then arranged the flowers and glued them down, some with liquid glue, some with foam dots - just to add some dimension. I white embossed some sentiments on black card stock. For a final touch, I splattered some ink on my cards. I also wanted to try the stencils with modelling paste. For this, I colored some white paste with two of the ink sprays, then applied them onto white card stock. For the orange one I used a new stencil called Skylight. While these were drying, I stamped YOU with matching inks, then die cut it. I white embossed the rest of my sentiments and cut them into thin strips. Time to assemble my cards! I adhered the orange panel to my card base, added the sentiment and some twine, et voila! For the other one, I trimmed off some of the stencilled panel, then attached it to the card base. I decorated this card with some lace trimming and twine. On my next card I went old school! I used the Flowing Hearts stencil just like I would in my childhood: As a template. I drew in the lines with a black pen, then painted the hearts using the Puffy Heart and Cosmic Berry ink sprays. I attached this panel to the card base and splattered ink all over it. I popped up my sentiment and glued it down. I generally don't go for one layer cards, but I kind of like how this turned out anyway. I think I should have kept to my color scheme, because these last two cards now look a bit out of place! I dry embossed some blue card stock using the Square Weave Pattern and Flowing Hearts stencils. I created a shaker window on one of the cards, and filled it with a mix of blue and red sequins. I stamped a star from the Peace Love Joy stamp set and adhered it to the acetate window. I stamped my sentiment on a white strip, using red ink. To finish this card, I wrapped some twine around it. I fussy cut out my hearts and stamped another heart, which is also from the Peace Love Joy stamp set. I glued the two embossed hearts onto my card front and popped up the stamped heart. I tucked some tangled thread behind the heart before attaching it to the card front. I stamped the sentiment in red ink and added some red sequins! Done! 1. To celebrate this release, Altenew is giving away a $50 gift certificate to 6 lucky winners! 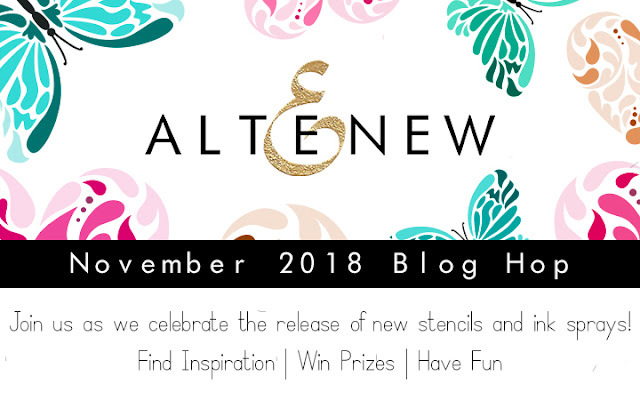 Please leave a comment on the Altenew Card blog and/or Altenew Scrapbook blog by 12/03/2018 for a chance to win. 6 winners will be announced on the Altenew blogs on 12/07/2018! 2. I will also draw a winner to receive a $30 gift certificate! I will announce the winner on 12/03/2018. Comment away!!! The winner is Handmade by Hanneke! Congratulations! Please contact me at mzs6666@googlemail.com so I can tell you how to pick up your prize! Thanks so much for stopping by today! Your next stop is TaeEun Yoo's blog. Enjoy! WOW! Such gorgeous cards! I love the creative backgrounds - they really make the flowers pop! They are absolutely gorgeous. Thanks for sharing. Awesome inspiration! Really love all the cards. And the new release is fabulous! You sure made a lot of lovely cards. Thanks for the chance. wow your cards are just gorgeous - LOVE the textured backgrounds!!! You have created a fantastic assortment of cards!! They're gorgeous and I appreciate all of the inspiration! These are all so pretty, especially each of the floral ones! I loved all your cards. What beautiful cards you have made! Love each one of them. I love all of your cards. You show so many great ideas using stencils. I can't wait to try all of them myself! I love everything you create and these beautiful cards are as lovely as I would expect. The last two card didn't look out of place at all. 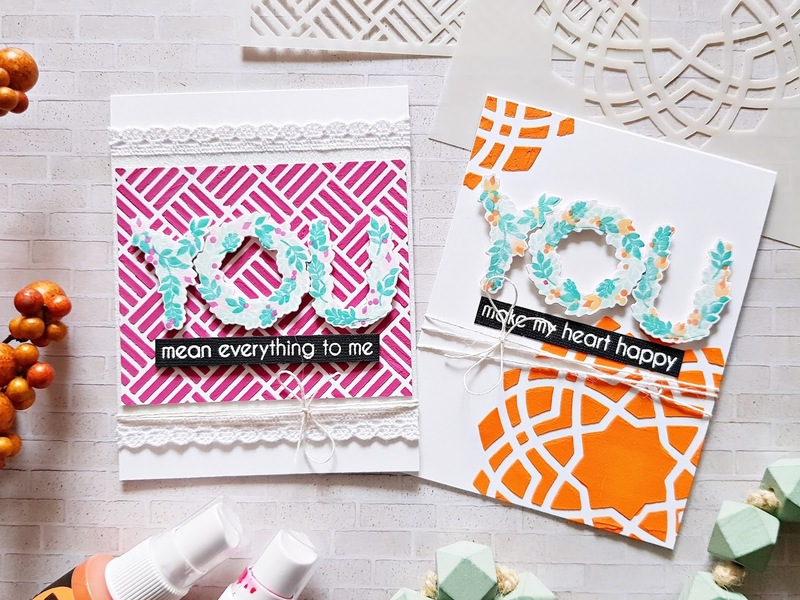 All of your projects beautifully showed off how important stencils can be to card making. Thank you. Wow, beautiful cards and techniques with ink sprays and stencils. Love the dry embossing and the outline of the flowing hearts stencil too. You are very talented! Love your beautiful work! Your cards are just so gorgeous and the different techniques you have shared using the stencils is fabulous!Love your inspiration ! Fabulous cards. I especially appreciated how you used the stencils to emboss, use with embossing paste and just plain used the ink spray. They are all stunning in their own way. Thanks for the inspiration. All of your cards are stunning. But I think the old school one later card is my favorite! You won my previous giveaway but never got back to me! Did you pick up your prize?! 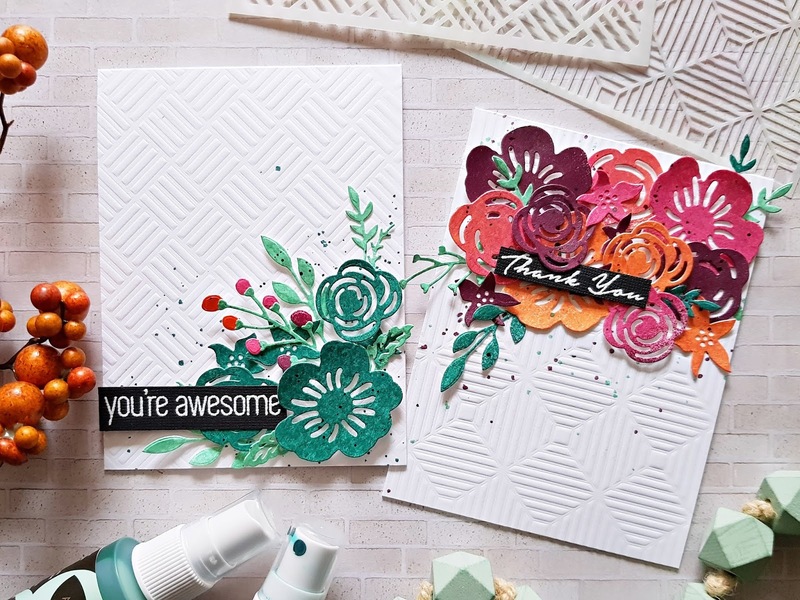 I love the way you showed three different ways to use these stencils and shimmer sprays! That handpicked bouquet stamp is one of my favorites. I just love the blues and greens in the background. Love your cards, they are so creative and eye catching. Beautiful Work! Beautiful cards!!! Thank you for sharing!!! All these cards are pretty, but the red heart one , is so fabulous and hot. Lovely designs very clean and simple but beautiful. Beautiful cards! I love the 2nd set where you die cut all the flowers. The colors are fabulous. Also, really like the heart card. Sometimes you just have to go old school! These are so gorgeous, thanks so much for all this wonderful inspiration! I really like the card with the pink hearts - my favourite for sure! Love all your gorgeous cards! Beautiful - I especially like how you used the heart stencil, embellishing the flourishes and adding the extra colour. Couldn't pick a favourite as they are all stunning and such great ways to use the new stencils and sprays. These are such pretty cards! At first I thought you had used paste to create the white backgrounds, so was amazed at how well the dry embossing came out. Lovely ideas! Beautiful cards!! Loved the way you used the stencils!! I will have to try the dry embossing with stencils. Beautiful cards! Wow! Beautiful cards. My favorite has to be the hearts. The outline you did sets off the design perfectly. Wow! Thanks for sharing! All of your cards are sweet using the new stencils! So many awesome cards. Love your backgrounds and vibrant colors! Wonderful card designs and great choice of colors. I love the innovative way you used the Flowing Hearts stamps outlining them and also the positioning of them. All pretty card, but this on is my favorite! They are all so pretty, hard to choose a favorite design. Thanks for sharing your ideas. So many gorgeous cards! I am especially loving the ones with the white paste and the last one with the outlines, adds so much! I didnt use white paste on any of them hahaha! Beautifully done... love how you dry embossed the background - turned out incredible. You’re funny Zsoka (you had me laughing all the way through your story). Lucky you to be living in Germany where craft supplies are so much easier to come by than in Canada). p.s. keep that Dutch boyfriend in line (I'm half Dutch lol). Loved ALL your work but gotta say I like the traced shapes in the heart best. Yes, old school, but you did such a great job with it that it ended up a fabulous one layer card. I'm loving what you did with these stencils! The backgrounds with the weave stencil look fantastic and I love the way you colored in the heart stencil with the different colors. Shaker cards are always fun. So many great projects! I love seeing the many different ways one can use stencils that you've demonstrated. I think my favorites are the white-on-white square weave and beveled squares. I feel like those would be real workhorses in my craft room. Thanks for sharing your creativity with us! What wonderful inspiration you bring with these projects. I am glad you tried the one-layer card because it is my absolute favorite! Gorgeous backgrounds which make those flowers pop! Loving the stencil embossing. Very nice! Wonderful selection to share with us, I want to make cards this pretty. Beautiful cards. I love the dry embossing with stencils technique and these new stencils are perfect for it. Can't wait to give it a try. All these stencils are lovely and your cards showcase them beautifully. Thanks for sharing your creativity. I love seeing holiday cards with unique colours! Love the mountain mist spray in this release and how you used it in the faded background!